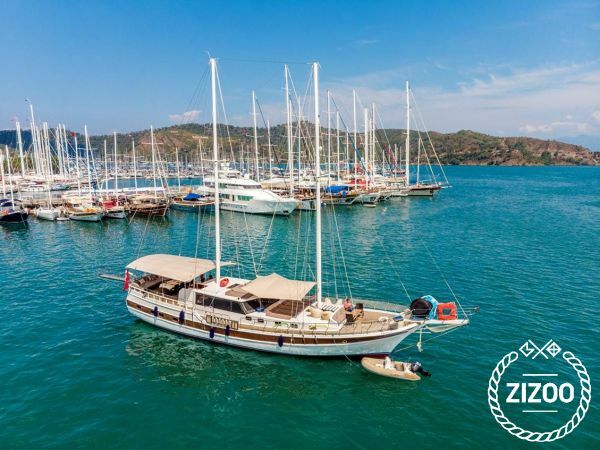 This gulet Nika 7 is a 23 meter-long wooden gulet with 6 cabins, which can accommodate up to 12 guests and is a preferred yacht for great cruises in the unique waters of Mediterranean and Aegean sea with its 3 professional staff. All of the cabins are equipped with air conditioner, wc, shower, clothes closet and hair dryer. There are separate sunbeds for all our guests, relaxation areas in the front and rear, chairs, tables, service kits, security equipment, glasses and pallets. There are separate recreation and living areas for our staff. The gulet Nika 7 has a fully equipped kitchen, bar, ice machine, freezer, fridge, music player and Lcd TV.